1/2 - 1 cup low-calorie, oil-based salad dressing (like from Wishbone). Suggestions: Italian, Sesame Ginger, Raspberry Vinaigrette. 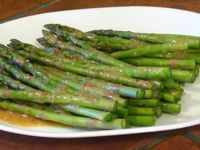 Trims ends off of asparagus. Cut each stock in half. Place in a large ziplock bag. Pour in dressing. "Massage" the bag to make sure asparagus is fully coated. Marinate in fridge for 30-60 min, massaging the bag a few times. Preheat oven to 380 degrees (Yes, 380 is not a typo). Remove asparagus from bag. Place on a baking sheet that has been sprayed with non-stick cooking spray. Bake 15-18 minutes. Serve immediately.